Hasn't the past two days been glorious. The rains appear to be gone and the gorgeous Florida Sun is basking the area in beautiful sunshine. Thanks to the rains, the place is starting to perk up and look green again. My yard is looking better and when we get done with planting our new purchases from the Garden Expo, it might not look so frost bitten. A wonderful thank you for the Garden Tour this past weekend put on by the Stuart Garden Club. They were beautiful and it was so much fun to look them over. I would recommend it to all for next year. Okay, so you are asking yourselves what is Egg-specials.....well, it is a fun weekend we have planned for Friday and Saturday. Although, I must admit I was disappointed when I saw all the beautiful eggs on Margy's desk and thought CANDY! But alas they were empty. The eggs will be filled on Friday with slips of paper that will make you very happy. Now how can a slip of paper make you happy? It is the discount you will get on your purchases. It will range from 10% to 30%. This is the discount you will get the whole day on anything you purchase. So, let's say you make your choices and you open your egg. You are enormously pleased. You can go and ring up some more at that discount. Only one egg choice per customer per day. All sales are final. No Clubhouse points or Gift Certificates can be awarded or redeemed. There is some bad news....you can't keep the egg....we will need it for the whole weekend. 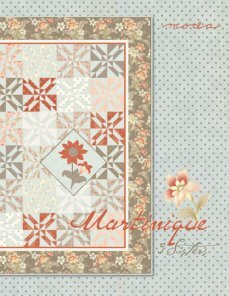 This discount does not apply to the new Martinique fabrics (see below). Now how is that for Egg-specials? We are also doing some Spring Cleaning and it is time to purge some notions. They will be on display in the Sample Room (the old classroom) at reduced prices. These are not eligible for the egg-special discount. We also will have Old Kits on special Buy one and get the another one of equal or lesser value for FREE. Also, not eligible for egg-special. No points or Gift Certificates maybe awarded or redeemed. Now the exciting news, we have finally received in Martinique by Three Sisters for Moda and it is wonderful.www.unitednotions.com/fcc_Martinique.pdf Imagine a romantic island retreat with lush tropical flora, cool island breezes, warm sunny beaches, and beautiful fabrics surrounding and covering comfortable rattan, Old World furnishing in deep dark mahogany, and cool patio furnishing. Now doesn't that sound like where we live and enjoy life. The hand of the fabric is great. The colors make you feel like a Caribbean retreat on the par with Tommy Bahama. It is the fabric line for us. The have a fabulous feature floral and an outstanding passiflora sundress fabric pattern in a category all its own as it boasts sophisticated botanical toile feature. There are coral branches that dance across the fabric. The tone on tone beauties with a vine pattern make for quite a unique fabric line. Earlier we received the pre-cuts and still have them available in jelly rolls, layer cakes and charm packs. We have cut fat quarters from the twenty-six bolts of fabric. 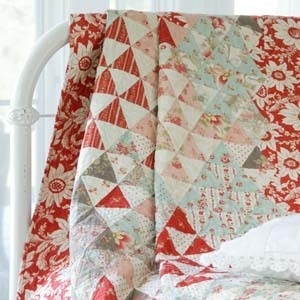 We also have pintucks, chenille and a multi patchwork fabric that match the luscious colors. 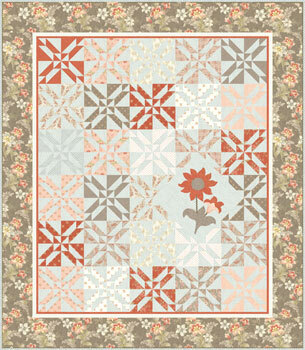 We have the Martinique Project sheet where one regal flower blooms in a field of muted color. The pattern is included for free with the purchase of the fabric. The quilt is 80" x 90". Still room in classes next week. Look at the website and see if you can squeeze them in. 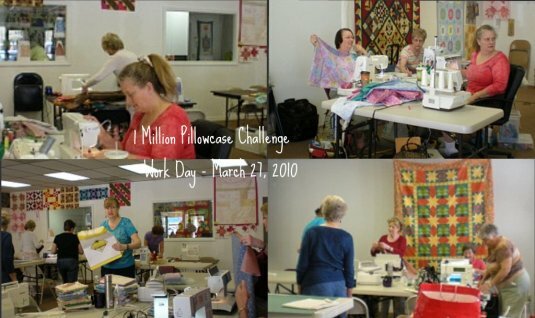 You missed a great CAKE and fun last weekend with the group making pillowcases for the 1 Million Pillowcase Challenge. We are at 722 pillowcases and have added the Center for Aging in both Martin and St Lucie County as recipients. We hope to see you soon and that you have a great Easter and Passover. Take care!